As a part of the Chang’e-4 lunar far side mission, two formation flying microsatellites will be launched to the moon in 2018. The microsatellites will be launched into a 200 km × 9000 km lunar elliptical orbit by a CZ-4C rocket, together with the L2 relay satellite. These microsatellites have similar configuration, with a volume of about 50x50x40 cm3 and a mass of about 45 kg. The main payload of these microsatellites are synchronized receivers in 1 – 30 MHz range, acting as an interferometer, to investigate radio radiation from celestial bodies in this band. The moon will shield the radio radiation from earth and sun, make it a unique position for this measurement. Distance between two satellites will be adjusted between 1 km and 10 km to provide a variable baseline. 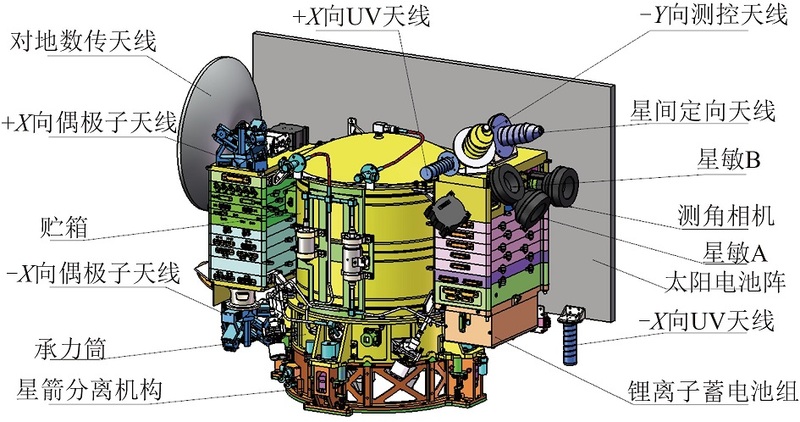 The project is led by Harbin Institute of Technology, and has payload and science team from National Space Science Center, CAS and National Astronomical Observatories, CAS. There will also be a camera developed by King Abdulaziz City for Science and Technology of Saudi Arabic onboard satellite B.